1. Wire, when installed correctly, will last for 30-50 years if not longer, really the only weak point is the post rotting out eventually. 2. Wire fence is a lot safer than boards since it has a little flex to it and the animals can not get their legs caught in it since the spacing is so small. 3. Maintenance and painting is much less since you only have 1 board to worry about. Having only 1 board is one less place to splinter, warp and have nails poking out to injure a animal. 4. If you live in a state where native timber is hard to come by then it is more cost effective to ship a few rolls of wire than truck loads of boards. 5. Wire fence can be made to curve like board fence for a little extra cost. 6. 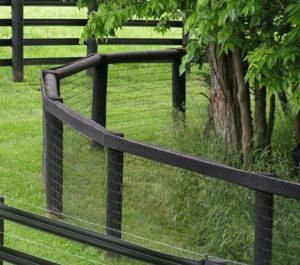 It can be installed very tall and still keep young foals from rolling under since the wire is 4 foot tall and you can raise it 6-12 inches off the ground giving you a good solid high fence. 1. More expensive initially to install, in some cases. 2. Could cause more injury to a horse if they try to run through it. 3. It is harder to repair than board fence. 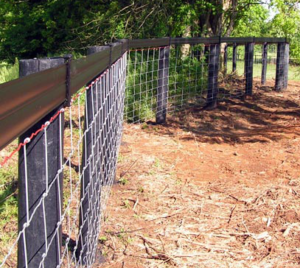 There are many different types of wire fence. 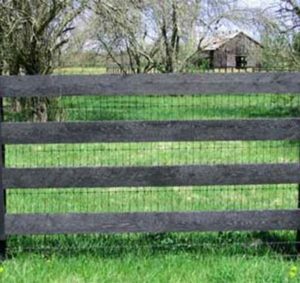 The main type at least for horse farms would be Vmesh fence, or 2X4 knotted wire with either a oak board or even Centaur on the top. Wire fence can be curved, and not fall over in a year, but only if its done correctly. Wire fence cost is also on the rise since the market for steel and scrap steel is getting very expensive. 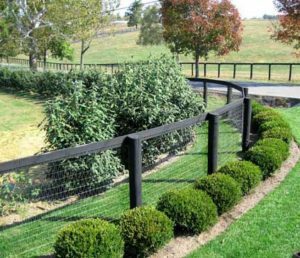 Wire fence is very strong and will give you a lifetime of use but is really not good to have around tree lines or along a road. When the first ice storm knocks all those limbs onto your wire fence it will it will demolish it. Cars running through it doesn’t help much either. Another place that wire is not a good choice is in flood zones since any debris will be caught in the wire and can push the fence over. One other good thing about wire is that it can be used to fence in smaller animals like alpacas, goats and sheep. 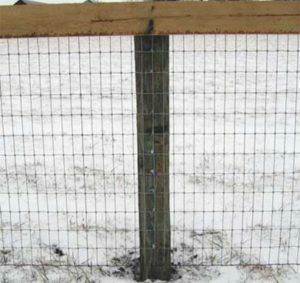 You can also put 2X4 wire underneath a board fence in places like your yard to give it a nice look but still be very functional in keeping pets in or neighbor’s pets out. This is the entrance to Jonabel Farms and shows just how great wire can be made to look. This curve is done without any bracing making it a cleaner looking curve. Even cattle wire can be curved. The posts in this curve have been concreted instead of being braced because of the Centaur rail on the top. Here is a great example of how wire fence can be curved to follow the contour of a tree line. You have to use good strong posts we like to use 9″ round posts for any wire curve. Here is a how the 2X4 knotted wire looks underneath a 4 board fence. This picture shows the 2X4 wire a little more clearly. As you can tell it is safe like V mesh wire, but what you can’t see is the price, which is much cheaper than V mesh fence.